Purchase tickets at the door tonight!! Driven by her love and fear of New York City, West got on a plane, got lost on the subway, and found herself auditioning for America’s Got Talent. 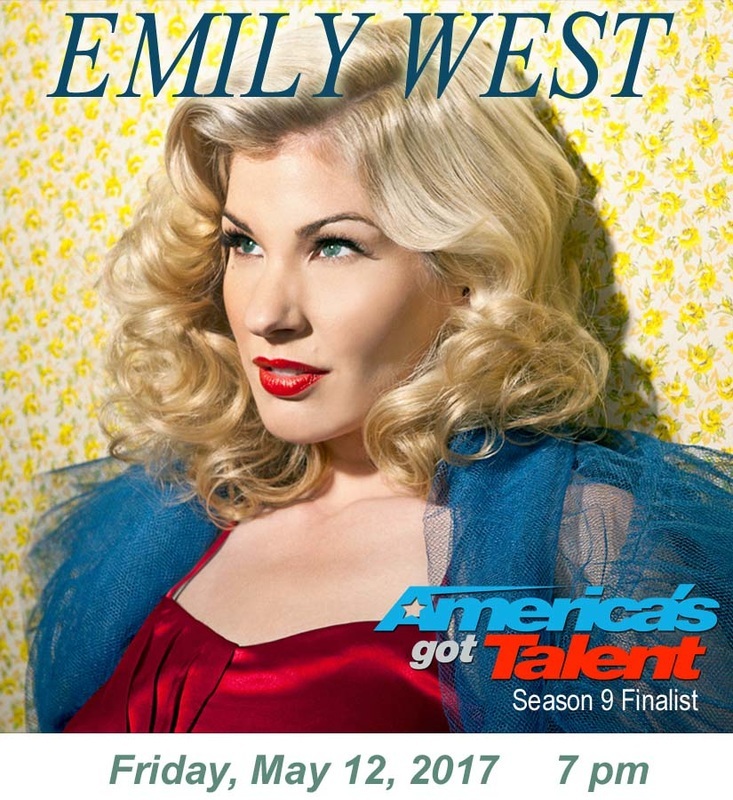 As a finalist on Season 9 (2014), West won crowds over, including AGT judge Howard Stern, with re-imagined versions of songs like the Moody Blues’ “Nights in White Satin” and Sia’s hit “Chandelier.” Her mentor and idol, Cyndi Lauper, whom she met during an episode of NBC’s The Celebrity Apprentice, appeared with her on the AGT finale. Following AGT, West signed with Sony Music Masterworks’ Portrait imprint. Her debut album “All For You,” features three original songs co-written by West including “Bitter,” which has charted in the Top 30 on AC radio, with its music video premiering on Yahoo Music. RollingStone.com raved that “’Bitter’…swells and soars thanks to West's impassioned vocals. Heartbreak has never sounded quite this uplifting.” All For You also includes a stunning duet with Lauper of “True Colors” and unique covers of “Without You” (David Guetta & Usher), “You Got It” (Roy Orbison) and the songs that made her popular on AGT. West started 2015 with a bang, releasing a video collaboration with YouTube series Postmodern Jukebox where she performed a Roy Orbison inspired version of Kanye West and Paul McCartney's "Only One." Shortly thereafter, she was invited to open for comic legend Jay Leno on his national tour and continues to do so today. In April, West launched her one woman-show with a multi-city residency tour in New York, Philadelphia, Los Angeles and Chicago. She won over audiences with her soul-bearing vocals, captivating personality and guest appearances from the likes of music icon David Foster, pop artist Who is Fancy and legendary songwriter and producer, Mark Hudson. West was recently featured as one of the “Women of Gravitas” for the fashion brand, Project Gravitas, who premiered their “Emily Skirt” inspired by the artist. A portion of the proceeds from the skirt benefitted the Education through Music Foundation. West has shared the stage with Lauper at her annual Home For The Holidays benefit concert in New York, co-hosted the red carpet at the first American Country Countdown Awards in Nashville and the featured vocalist at an HRC Gala in Las Vegas honoring Rob Reiner. She has performed the National Anthem across the country at major sporting events for the NHL, MLB, NBA, WNBA and the Kentucky Derby. This fall, West hits the road on tour. In addition to solo dates in September, she will be a featured performer in America’s Got Talent: The All-Stars Live Tour, visiting 42 cities across the country. © 2015 Currahee Arts Council, Inc. d/b/a Northeast Georgia Community Concerts.